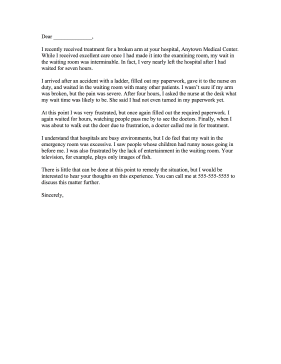 This printable complaint letter to a hospital or clinic addresses the problem of long wait times in the waiting room. I recently received treatment for a broken arm at your hospital, Anytown Medical Center. While I received excellent care once I had made it into the examining room, my wait in the waiting room was interminable. In fact, I very nearly left the hospital after I had waited for seven hours. I arrived after an accident with a ladder, filled out my paperwork, gave it to the nurse on duty, and waited in the waiting room with many other patients. I wasn't sure if my arm was broken, but the pain was severe. After four hours, I asked the nurse at the desk what my wait time was likely to be. She said I had not even turned in my paperwork yet. At this point I was very frustrated, but once again filled out the required paperwork. I again waited for hours, watching people pass me by to see the doctors. Finally, when I was about to walk out the door out of frustration, a doctor called me in for treatment. I understand that hospitals are busy environments, but I do feel that my wait in the emergency room was excessive. I saw people whose children had runny noses going in before me. I was also frustrated by the lack of entertainment in the waiting room. Your television, for example, plays only images of fish. There is little that can be done at this point to remedy the situation, but I would be interested to hear your thoughts on this experience. You can call me at 555-555-5555 to discuss this matter further.